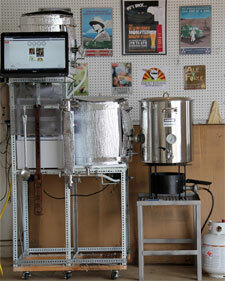 The Ale Force1 Brewstation (AF1) came about after getting a lot of help from my Brewmentor, Alan Smit. The heart of the brewstation is the AL-9000 control box that utilizes the functionality of an Embedded Control Concept’s BCS-460 controller. It allows me to control and monitor the temps in the hot liquor tank, mashtun and RIMS module, as well as the March pump. When it was first built in 2009, I was using 5-gallon orange coolers for my hot liquor tank and mashtuns. I quickly changed to 10-gallon coolers because some of the recipes I wanted to brew required a larger mashtun due to the amount of grain needed. Recently the AF1 was upgraded to “blingmanns”…I mean Blichmann kettles. One of the reasons for upgrading to larger vessels was so that I do a double batches easily so that I could invite a few BrewSchool club members who do not have all-grain equipment to come over for a brew session . After the brew session we’d all walk away with a 5-gallon batch each. Multiple batches with only one mess to clean up and maybe getting someone else hooked on homebrewing sounds worthwhile to me. After upgrading to the Blichmann boilermaker kettles for my hot liquid tank and mashtun, I was having problems trying to efficiently keep the temps where they needed to be (partly because of the colder weather). By using some Reflectix insulation around these two kettles I was able to get the efficiency of temperature regulation to what I was used to with the orange cooler setup. The insulation is velcro’d together so that it can easily be taken on/off for cleaning. Dell 2305 Touchscreen monitor for controlling/monitoring the AL-9000 brewstation controller. The brewstation also holds other parts and tools in inexpensive plastic drawers underneath the hot liquor tank. The reason for having the “Afterburner” boil kettle stand built was so that I could attach the trub filter and plate chiller into the mix before the wort goes into the carboys. I needed extra height because the trub filter is around 17″ long and the plate chiller adds another 4 “. Lifting a kettle filled with around 12 gallons doesn’t sound safe, so I decided to have the kettle up high enough to allow for those components to fit in between the kettle and the carboys. Showing the boil kettle with the trub filter attached and plate chiller, splitting two batches of wort into two 6-gallon carboys. When someone helps you as much as Alan, you have to name it after him, plus it sounds kind of techie, so I call it the AL-9000. Using temp probes from Brewers Hardware that are designed to work with the BCS controller and heating elements or bucket heaters plugged into the outlets it can’t get any easier. Everything is modular. The switches are on the box incase a need arises to manual turn off a relay. Control box opened up consisting of the BCS-460 controller, relays and switches. The black box on the bottom right is the BCS-460 controller. 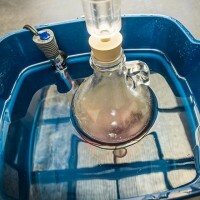 New invention for cleaning the inside of a glass carboy, a pivoted cane that can be fitted with anything you want to clean the inside of a carboy.